Back in 1955 when I joined the Anerley Bicycle Club, the club—room was above a pub in Thornton Heath called “The Simla”. Simla is in Northern India. Being a romantic, I felt inexorably drawn to the distant hill—station 7,300 ft up in the Himalayas. 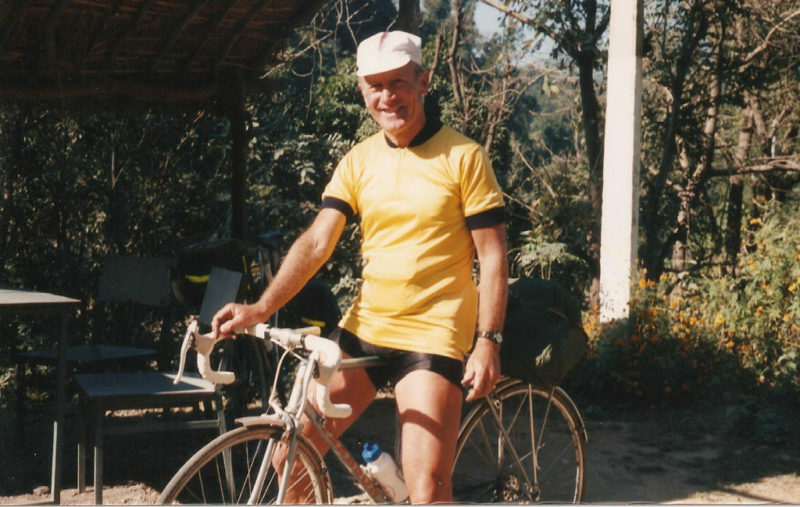 John Dadson, club racing secretary, and I flew in November 1995 direct to New Delhi from London and stayed two nights with a Sikh family, friends of a friend. Air Canada took us, the bikes went free with no dismantling whatsoever, just popped into a plastic bag. An excellent airline. After sightseeing in New Delhi by motorised rickshaw, and noting the traffic rules — none! 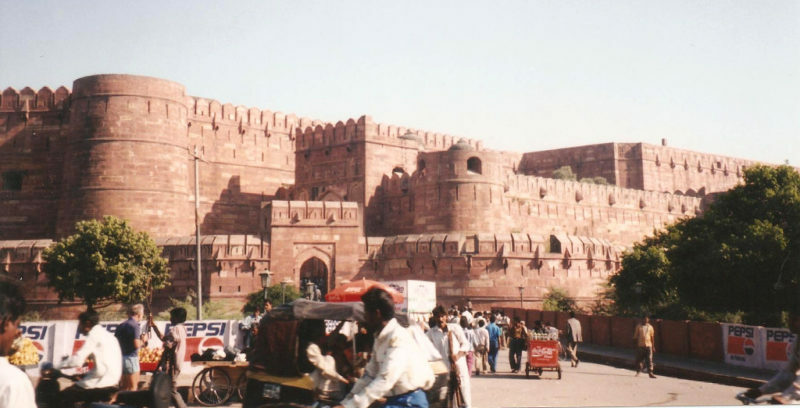 – we set forth due south next day on the Agra arterial road, in the morning rush hour. 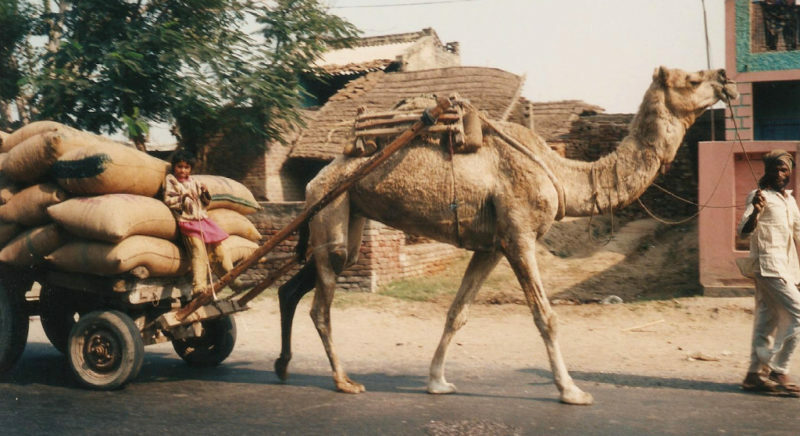 Lorries, buses, cars, rickshaws, bikes, cows, camels, pigs, dogs, fought for every available foot of road, accompanied by an incessant cacophony of ear-splitting klaxons. With senses at red alert we fought our way out of the city and eventually relaxed in open country. Dreadfully squalid shanty towns made us shudder, and dust, sand, and black vehicle fumes assailed us. The terrain was billiard-table flat, as it would be for some days. An imposing hotel at Kosi Kalan, 74 miles from Delhi, was our night’s stop. we haggled the price down from Rs12OO to Rs800, by far the most expensive room of the tour (Rs50 = £1). 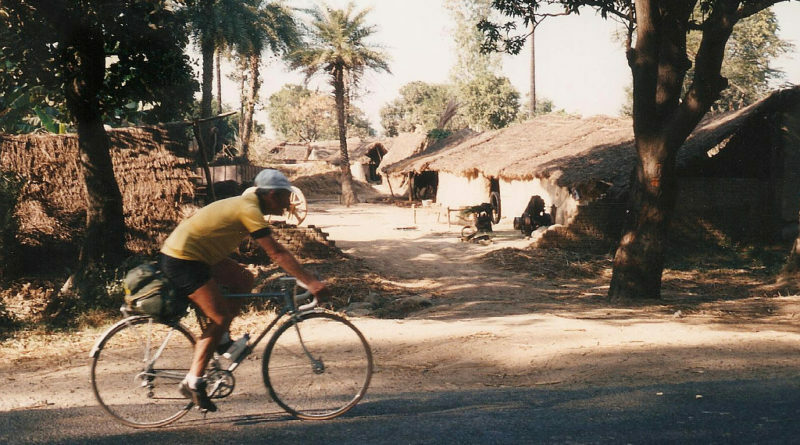 We had stopped en route for tea and snacks at filthy tea bars in villages, and had been surrounded by crowds of men and boys staring at us in wonder and bewitched by our bikes. We did rather stand out with our Lycra shorts and gold tops. we gathered crowds wherever we stopped, town or village. 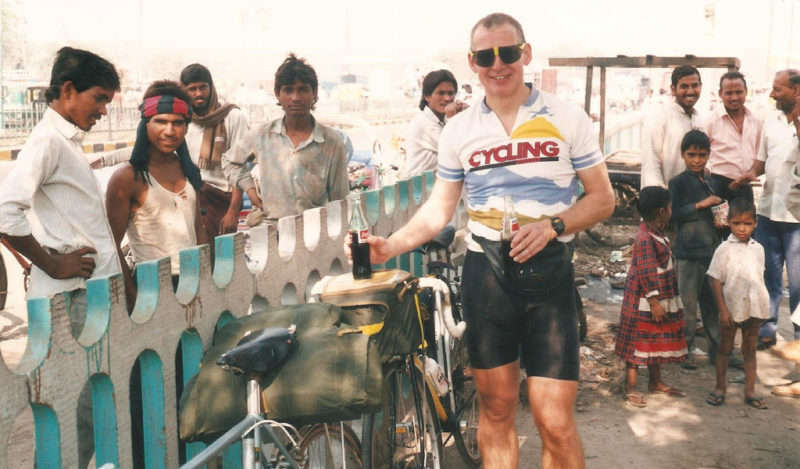 Next morning we set off to Agra, 71 miles away, with a tail wind. We were disconcerted to find oncoming traffic on our section of dual carriageway! Bananas and apples were cheap and Pepsi, Coke and “Thums Up” plentiful along the road. Water buffalo, oxen, and camels hauled carts along, the drivers sometimes fast asleep on their loads. The weather was hot and sunny, as it was virtually the whole 750 mile, three-week tour. Only in the mountains did it become cool. The sheets on our beds in the Agra hotel had been slept in. Our Hindi phrase book covered this eventuality. “Ganda chadar” (dirty sheets). The young man nodded happy agreement, changed them, and then asked for a tip! Our evening meal in the courtyard was enlivened by a family of monkeys climbing walls and. drainpipes, and tight—rope walking over power cables. Next morning our motor rickshaw took us to the Red Fort, a fortified town built by the Moghal Emperor, and then after lunch, to the Taj Mahal. 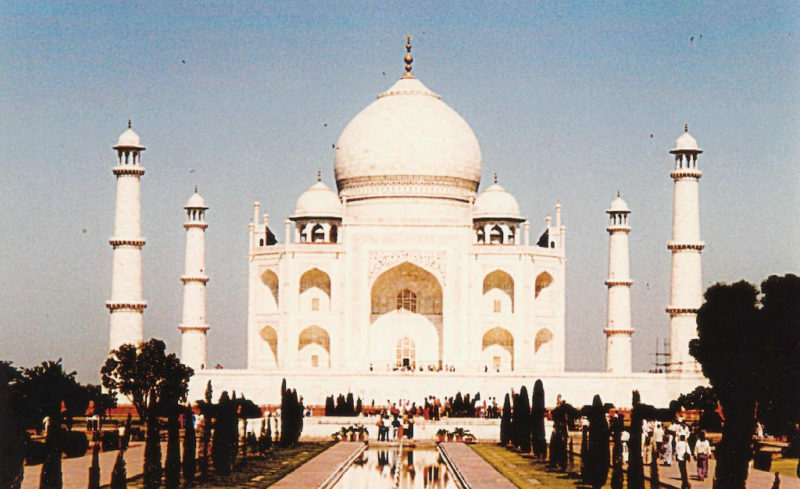 Built as a memorial and mausoleum for his beloved wife Mumtaz by Emperor Shah Jahan in 1648, it truly is breathtakingly beautiful, its white marble shimmering in the hot sun. We sat drinking it in, we touched it, explored it, and felt overawed by it. We now headed north-east to Aligarh, 65 miles away. Traffic was light, there were delightful mud—hut and straw-hut villages with cattle and chickens foraging, and cow—pats, shaped by the women into discs, drying in the sun to be used as fuel. On both sides of the road were sugar—cane plantations, giving way to bananas at times. Monkeys and parakeets frolicked at the road’s edge. Snowy egrets stalked the ponds and lakes. Heavily laden ox-carts trundled along, sugar cane engulfing the cart, and, cycles rattled along carrying milk churns, huge gas cylinders, and often passengers sitting side-saddle on the rear carrier. Still we headed. north-east, our destination being Sambhal. My rear tyre wall fractured after hitting a rock in a particularly vicious stretch of road through a town. Stopping for a repair I was surrounded by a crowd of men and boys_about 30 strong. On completion of the repair I held out my cap and said “Two rupees, please!” They looked bewildered! I give audience demo in puncture repair! 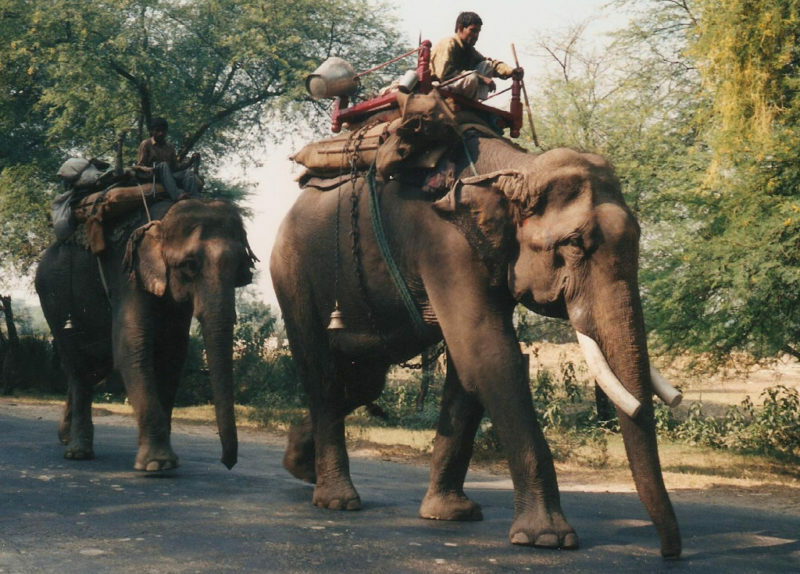 Further on John and I overtook two elephants with their mahouts. 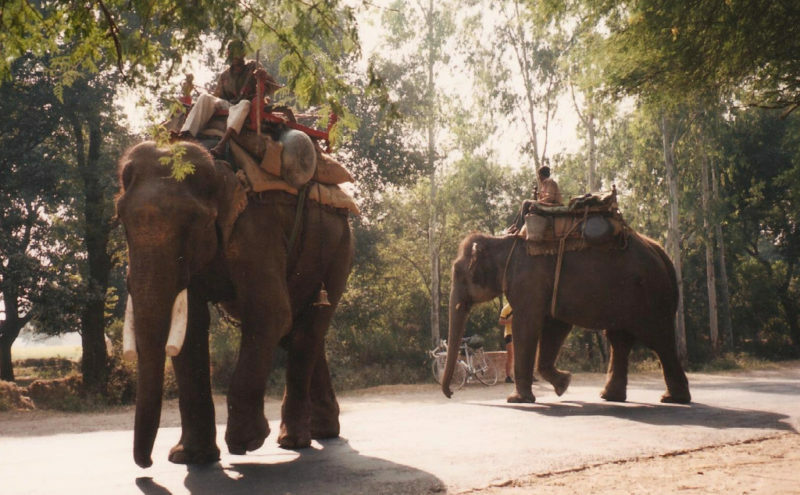 We stopped to take photos, at which the mahouts shouted angrily., the one nearer me gave his elephant a command and jumbo wheeled in the direction of my Pearson, leaning unsuspectingly against a tree. I leaped. to my bike, jumped aboard and skedaddled, just as jumbo’s trunk stretched for us! 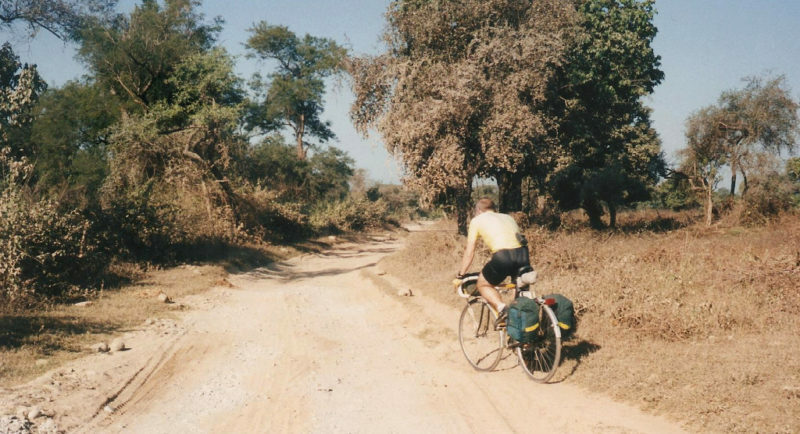 John also grabbed his bike as the second elephant loomed large over him, and we quickly distanced ourselves from the predatory pachyderms. 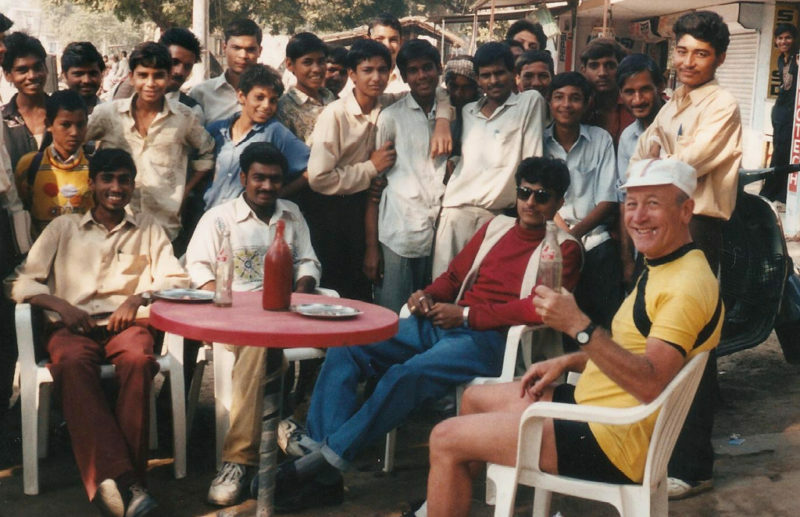 We got lost that day, ending at a police post, where the boss held court at a table on the veranda. He sat on one side of the table, we facing him, his minions fawning around. On the table, lined up with me, was his revolver. He thumped the table to emphasise a point, the revolver jumping. I hoped that the safety—catch was on! He insisted that we took tea with him while he drew us a sketch—map of our route. We rode about 30~odd miles in hot sun and could find nowhere to get a drink of any kind. After 80 gruelling miles we staggered into Sambahl. The map we were using was a German one, Nelles. At 1:1,500,000 (24 miles to the inch) it wasn’t much use, but it was the best obtainable. Frequently we used a compass to verify direction. Direction signs were in Hindi, so navigation was a bit tricky! 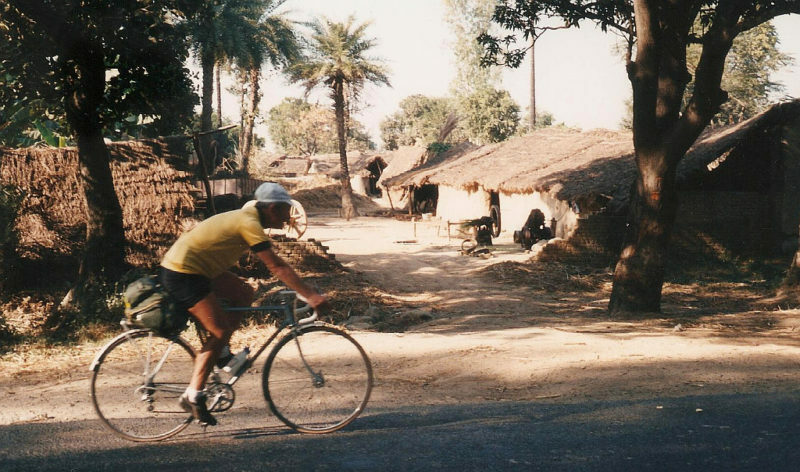 Next day we had a pleasant, short ride of 30 miles to Moradabad and, arriving at noon, a chance to relax and stroll around. We were nearing the Himalayan foothills on reaching Ramnagar, 6O miles on. Meandering through banana, apple and almond plantations, we saw vultures massing on a carcass, and a dead six-foot snake in the road. Lovely rooms at a tourist lodge at Ramnagar were ours for £2. From here we could get a permit to visit the Corbett Tiger Park next day, one of our tour aims. Leaving our bikes at the lodge, we drove into Corbett Reserve. It’s about 35 miles square and borders the Himalayas, amid breathtaking scenery of lakes, rivers, and mountains. The Reserve contains almost lOO tigers. To my surprise the wire fence at the Reserve gates was about four feet high! After driving into the heart of the park, we lodged at a tiny village hard alongside the lake, Dhikala. Two-hour elephant safaris into the jungle were available morning and afternoon. John D went hunting tigers but saw only deer, monkeys, and exotic birds. A log hut was our bedroom for the night and at about 3,000 ft 1g) it was distinctly cold, so much so that we slept fully clothed, covered by two wafer-thin blankets. Leaving the Reserve next morning we returned to Ramnagar and thence to Kotdwar, about 50 miles to the west. Unfortunately, John became ill and was bedridden for two days with a fever, necessitating calling a doctor. I rode into the Himalayas by myself, towards Lansdowne. Climbing steadily, and often in 31 inch bottom gear, I reached 4,000ft in 2.5 hours, arriving at a mountain hamlet with tea—shop! A kindly old chap bought me two teas, then my conscience pricked me. Poor John, languishing in his sick bed. Better not leave him too long! Waving my new-found friends goodbye, I freewheeled back about 18 miles, stopping only to photograph a roadside Hindi temple. 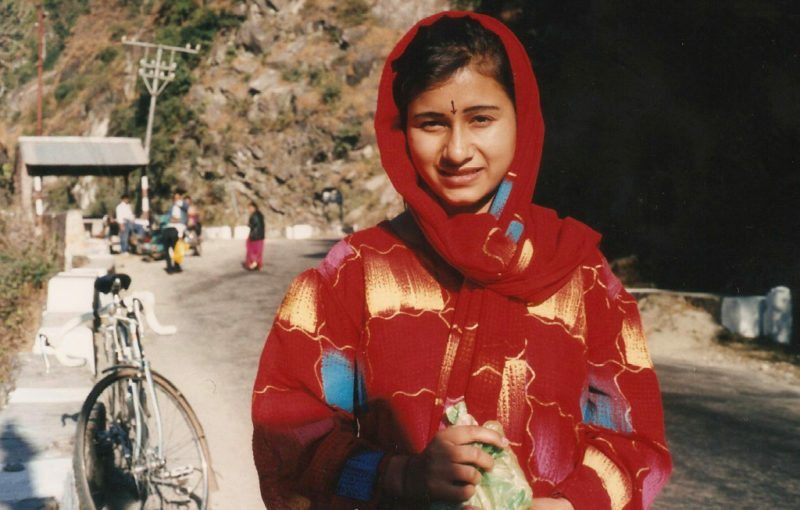 A beautiful sari—clad girl gave me an apple and a cake there. I liked her. She posed for a photo. 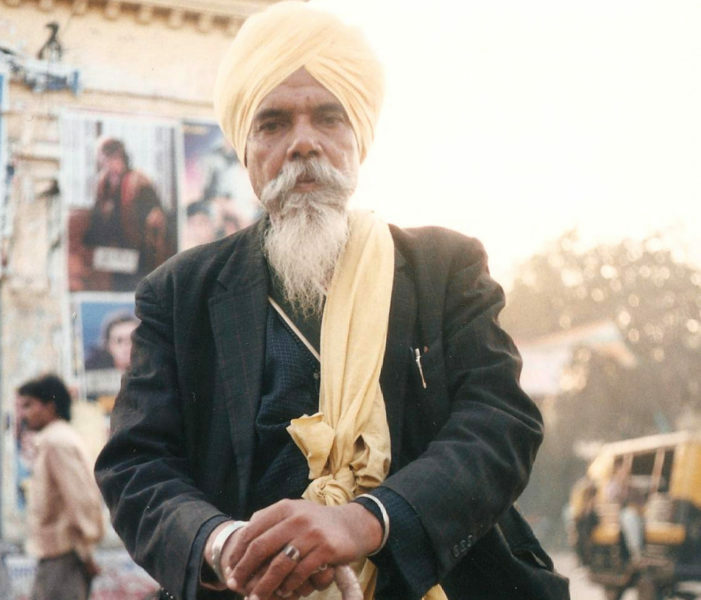 John had recovered from his fever and next day we set off at a gentle pace for Haridwar, a Hindu sacred city on the Ganges. The map showed 45km of main road to Haridwar. After 15 miles the “main. road” degenerated, into a rocky; sandy track through dense jungle. Sometimes we rode, sometimes we trudged. “How far does this go?” ran incessantly through my mind. After an hour or so’s trudging we saw a cyclist on a mountain bike approaching. He was a Dutch boy, also Hasled by the map. “Another two kilometres”, was his answer to my question. I breathed a sigh of relief! Suddenly, civilization! A village. We collapsed on a charpoy and swigged tea, happy once again. On our reaching Haridwar John’s computer showed 40 miles against the map’s 45 km! Finding a tourist bungalow on the bank of the Ganges, half a mile from the town centre, we rickshawed into town after a shower and strolled around. Temples and ashrams abounded, as did pilgrims. A holy man approached me. “You have a wonderful forehead. You are a happy man and have been blessed by God”, he intoned. Wise man said I’d been blessed by God. I agreed! Rising before dawn next morning, I walked to the ghats by the bridge over the Ganges. At dawn pilgrims would immerse themselves totally in the sacred river. The fastest—flowing river I have ever seen, the Ganges is fed by melting snows and glaciers of the nearby Himalayas. Icy meter and an icy morning! Stripping to their loin-cloths, the faithful immersed themselves totally. One step nearer so Nirvana! On to Dehra Dun we rode, changed money at the largest hotel in town, had a meal in their restaurant, mended a slow puncture, then on to Vikasnagar, a ride of 68 miles. The Hotel Shiva provided rooms for 100 rupees each. Room service did our washing for 10 rupees! A short ride of 40 miles to Nahan had a sting in its tail. We stopped at “Wish well” tea stall for tea and cakes, about six miles short of our destination. Unbeknown to us the final six miles were steep, unrelenting climbing to 3000 ft.
Booking into Hill View Hotel we were puzzled that a dilapidated building site was the only view from our rooms. One of my treats was to buy a bar of Cadbury’s chocolate most days, it being widely available in India. Every evening at dinner I would scan the menu for the least objectionable item and order it, admonishing the waiter: “Mujhe mirch masala pasand nahin” (I do not like spices and chillies). Sometimes it worked. 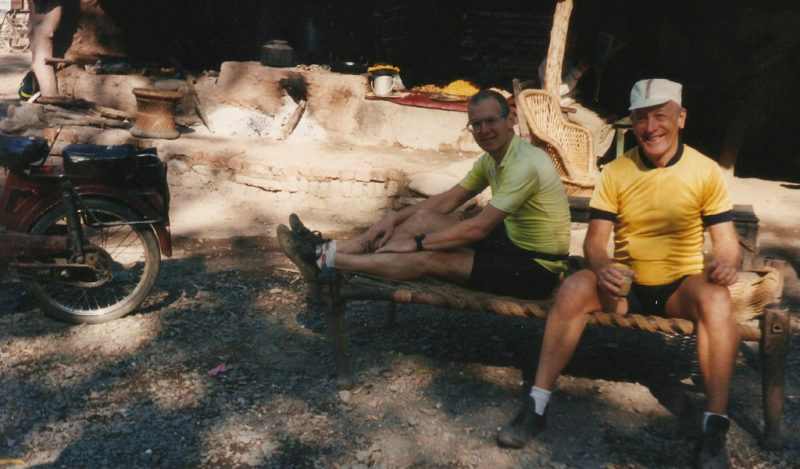 The following day was the hardest ride of the tour, 56 miles of pure mountain going. Hairpin bend on hairpin bend, lorries grinding up in first gear, the serpentine coils of the road leading higher and higher. The temperature dropped as we rose until at 6000 ft it was chilly. The views were superb, tender green Himalayan spruce growing luxuriantly, and snow-capped peaks in the distance. Eagles wheeled lazily overhead. Luckily we had made an early start and although the map showed 70 kms we no longer trusted it. Putting track-suit tops on for the descent, we twisted and plummeted down, avoiding goats, cows, and herdsmen, braking hard for the sudden stony, potholed stretches. The relief on reaching the junction which lead to Simla was wonderful. We sat in the sun; and each had two Pepsis and a big peanut toffee bar. Solan, our destination, was a further 12 kms of climbing, but that seemed. as nothing after traversing the mountain wilderness. Tourist bungalow rooms and a reasonable dinner rounded off the day. We both felt elated. The hardest day was behind us. For some days I had doubted our reaching Simla. 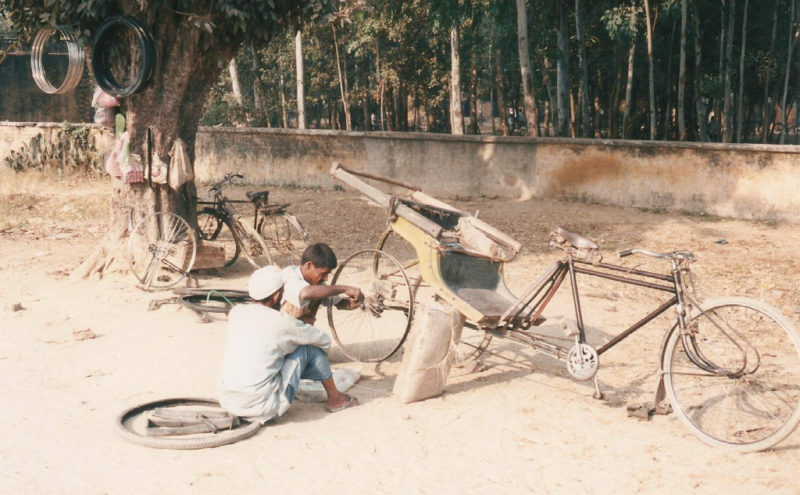 The poor state of our tyres, with no prospect of spares, and the threat of more time lost through illness had nagged at my brain as each evening I scanned the map, counting the stages still to ride. “Tomorrow we’re there!” I revelled in the knowledge thatjbarring a bizarre twist of fate, we’d made it. Off we set at 9.30 am, knowing that we had 30 miles to cover and that we needed to climb another 2,000 ft to Simla. The first 20 miles were undulating but easy, the real climbing starting a few miles from Simla with unrelentingly severe gradients. A last stretch of one in six took us to the tourist office on the outskirts of town. On stopping we were besieged by touts, offering all manner of delights. “Go away!” I said. They took no notice. “Go Away!” I repeated. They took no notice. “F*** off!” I bellowed. They did…. 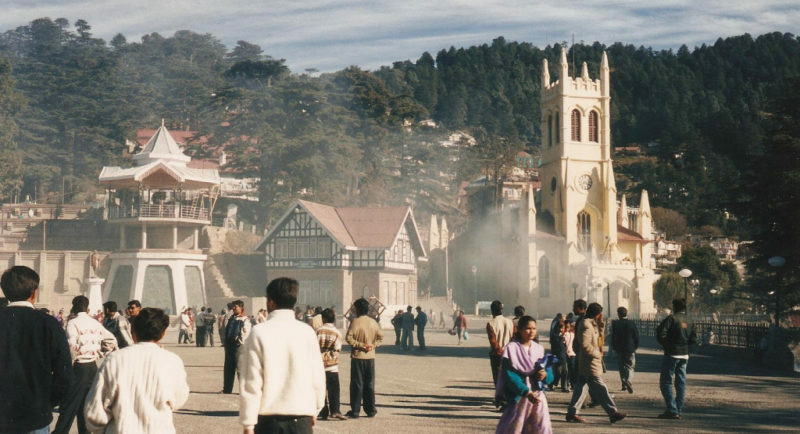 Simla, at 7,300 ft, is the largest hill station in the Himalayas, and was developed by the British in the early 19th Century as a government retreat during the unbearable summer heat of the plains. Its English~style church, Christ Church, dominates the town, in incongruous juxtaposition with the snow—capped Himalayas to the rear. Christ Church, Siml and bonfire. 7,000 ft up! The Viceroy’s Lodge is a large Victorian pile standing on a promontory, and streets have names such as The Mall and The Ridge. Scandal Corner is in Inid—town. The Gaiety Theatre proudly proclaims “Simla Amateur Dramatic Society, founded 1837”. One could imagine the garden parties, the balls, the croquet, the bridge, and whist drives, the dyspeptic colonels, the pomp and power of the heyday of Simla. Today, alas, it is seedy and run—down, with just a few shops in The Mall approaching London standards. Nonetheless we were elated to have reached our goal, and sauntered, round drinking it all in, in bright sunshine. Twitching the bedroom curtains next morning i[ was surprised to see snow! It didn’t last as the sun rose, and soon it was bright and warm again. 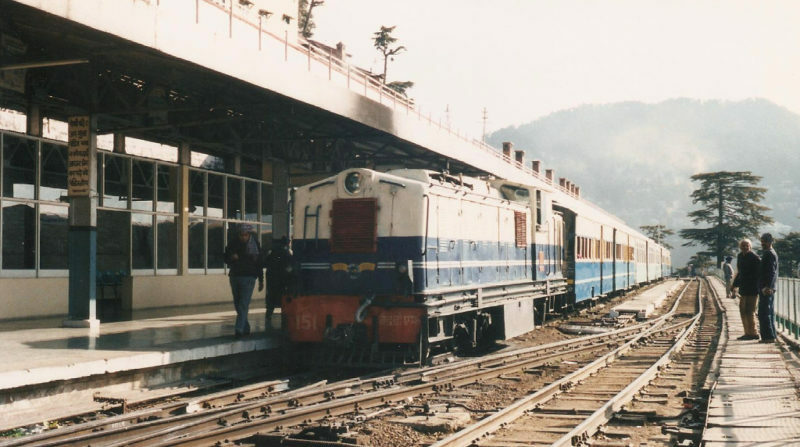 The British had bUuilt a narrow-gauge railway from Kalka, on the plain north of Delhi, to Simla, a wonderful feat of engineering. To gain height the track circled upwards in a spiral round the mountains, and used innumerable bridges, viaducts, and tunnels. The train was now Diesel powered and the service very popular. For £2 one could travel the 60~mile route in a first-class carriage, being rewarded with ever-changing mountain vistas. It wasn’t a fast route, taking five hours, with numerous leisurely stops when refreshment sellers would shout their wares from the platform. Rather than freewheel down the mountain to Kalka through the countless potholed villages, John and I chose to relax on the train. It was an experience. Transferring to the main—line train to Dehli, we had time to reflect on the tour. The noise, the dirt, the decay, the poverty. The colour, the vibrancy, the friendliness, the happiness, the contentedness; of people who often had no more than the clothes in which they stood. 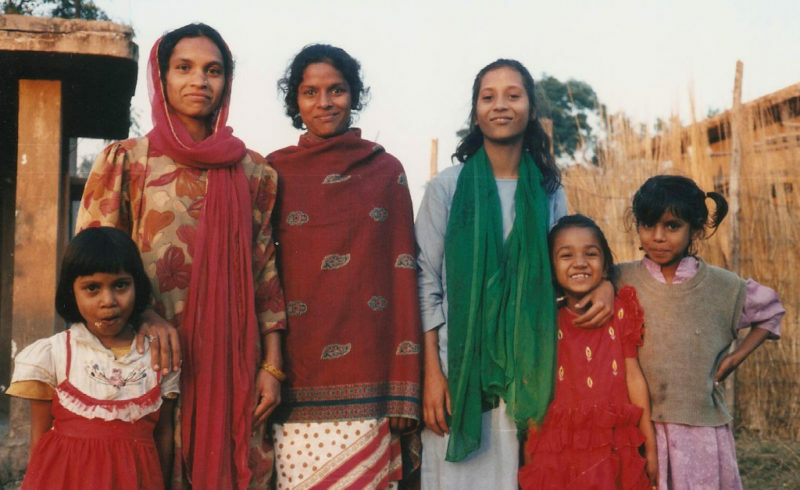 We had wandered around conscious that we each had more money in our wallets for a three—week jaunt than the average Indian earns in three years. A touch of reflective humility is no bad thing. India taught us that.